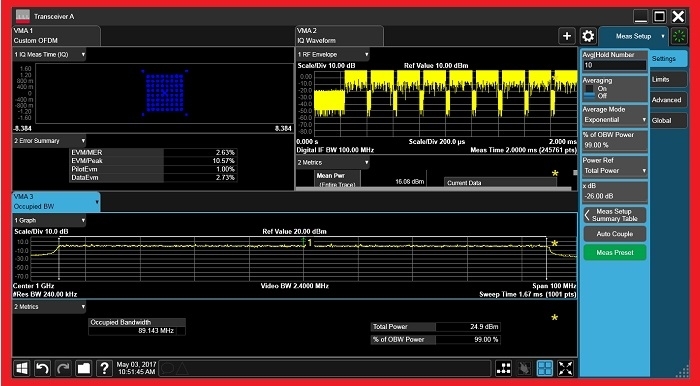 Keysight Technologies has released the Industry's first network emulation solution for 5G radio design verification testing. The new 5G RF DVT Toolset cost-effectively scales from sub-6 GHz to mmWave and from pre-5 G standards to new radio (NR). The toolset is the latest solution in Keysight's 5G network emulation solution (NES) portfolio and is based on Keysight's UXM 5G wireless test platform, as is the first-to-market, 5G Protocol R&D Toolset. The toolset is engineered to ensure measurement traceability - from early prototyping to acceptance and manufacturing. The 5G RF DVT Toolset uses Keysight's Test Automation Platform (TAP), allowing the design engineer to easily create and customize RF and radio resource management (RRM) test cases with the highest degree of parameterization.